Are you delivering a presentation that you wish you could preserve forever? How about sharing it with others that couldn’t attend? Maybe your dreaming of being the next Gary Vaynerchuk or Robert Scoble but just can’t do it off the cuff like they do. Well, Teleprompt+ is ready to help you with that and more. Teleprompt+ 2.2 has been upgraded to take advantage of the cameras in the new iPad 2, iPhone 4, iPhone 3GS, and iPod touch (4th generation or later)! It’s now a mini-production studio in one little tiny device. Get Creative! The hardest piece to becoming an Internet phenom is having awesome and interesting content. So get your creative groove on and start a new script or import it from Google Docs or Dropbox. Tap the camera icon and choose your recording quality. The quality depends on the device you are using and which camera. For instance here are various settings for the iPad 2 for each camera. The prompting will start and you’ll see your beautiful mug in a small preview window. Just tap the record button and have fun. Your teleprompter and camera are now integrated. Doesn’t get much cooler than that, does it? Take that incredible and informative video you just made and post it on YouTube. 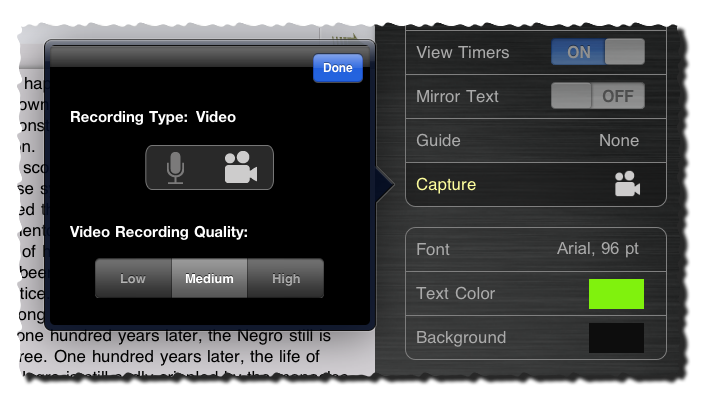 If you really want to get fancy install iMovie on your iPad and edit your video first. Remember us little people when you’re a superstar and give us a plug every now and then. There you have it. Eight simple steps to get your next presentation recorded. If you just want to share it or export it to your computer you can use iTunes file sharing when you connect your device to your computer. It’s as easy as dragging and dropping! You can then do whatever you want with that video. So for a low budget production studio the iPad2, Teleprompt+ and iMovie make a pretty mean combination. You can make some pretty incredible stuff sure to wow your boss, grandmother, significant other or some random person on the Internet with just a these simple tools. Isn’t technology great! Here’s a little presentation I made myself with just these 3 tools in just 31 minutes. You’ll see that I am not destined to be an internet superstar…I’ll stick to coding. This entry was written by Tim, posted on April 5, 2011 at 6:52 am, filed under iPad 2, Teleprompt+ and tagged Best Teleprompter App, Bombing Brain, iPad Teleprompter, Podcast Recording Tool, Teleprompt+, Teleprompter iPad App, Video Recording. Bookmark the permalink. Follow any comments here with the RSS feed for this post. Both comments and trackbacks are currently closed. I just purchased Teleprompt+ for my iPad 2. When I try to record the video is out of synch with the sound, and the sound is garbled. I’ll keep trying. Is this a known bug? Very strange issue your having. We’ve had no reports of this or ever experienced it. Have you tried restarting your iPad? You can do this by holding down the button on the top left of your iPad and then sliding the switch that appears which is labeled “Slide to power off”. Once it completely powers off hit that button again to restart it. Please let us know how it goes. You can always email support@bombingbrain.com if you still experience problems. Thanks! I’m having the exact same problem as the OP. I did the ipad2 restart, no joy. Please advise. I had the same problem. I’m not sure which fixed it but I had the speaker mute switch down and recorded at low resolution when I had the problem. I tried switching the speaker mute switch up and changed the video resolution to medium and it worked perfectly. Hi, I have recently purchased your teleprompter software and want to make youtube videos. The one in your example does not have a full screen picture. Is it possible to have a full screen picture? Yes the video records full screen. We just had our iPad in portrait mode so the video was recorded at 480 x 640 in high quality and YouTube requires the video to be a certain aspect ratio so we had to add the bars on the sides. I’d just recommend you record some video and if you plan to upload it to YouTube just make sure you know what the requirements are there and make sure it fits your needs. You can always adjust things after recording but planning ahead can save you a lot time in “Post”. Thanks! ©2014 Bombing Brain Interactive. All Rights Reserved.